Before I show you my very first craft of 2012 (craft 1 of 52: complete!) I thought I’d share this video in case anyone else is feeling a little blah that the holidays are over. If, like me, you’re a bit sad that your next three day weekend isn’t until Memorial Day, you should watch this dance, which was choreographed by the wondrous Kate Jablonski. 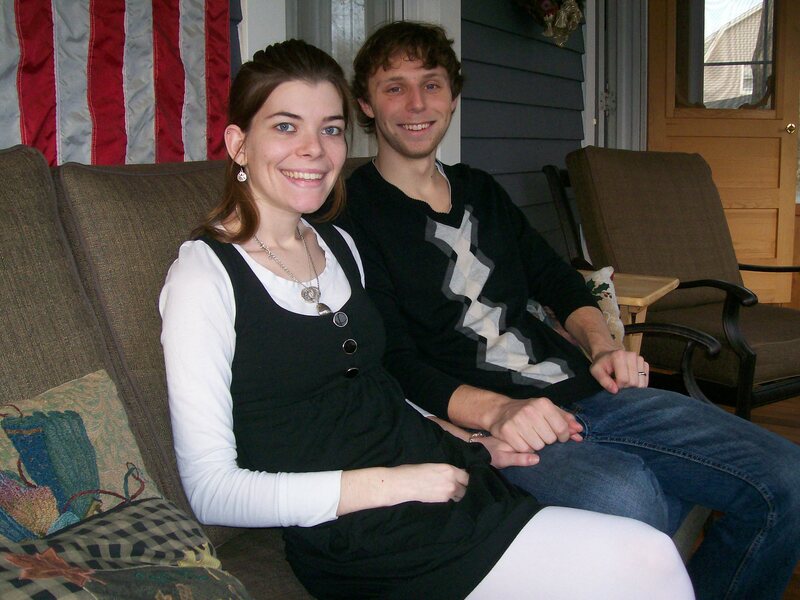 Afterwards, you can’t help but feel happy! I love the autumn colors in it. I decided to make a warm winter skirt out of it. 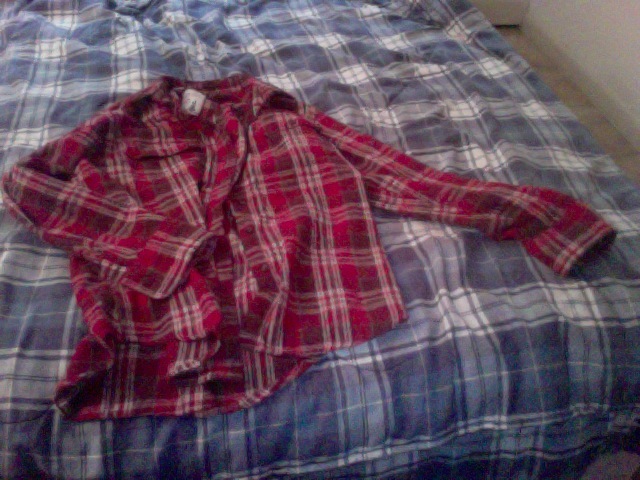 First, I cut off the sleeves and neck. A bit too redneck-y for me at this stage. 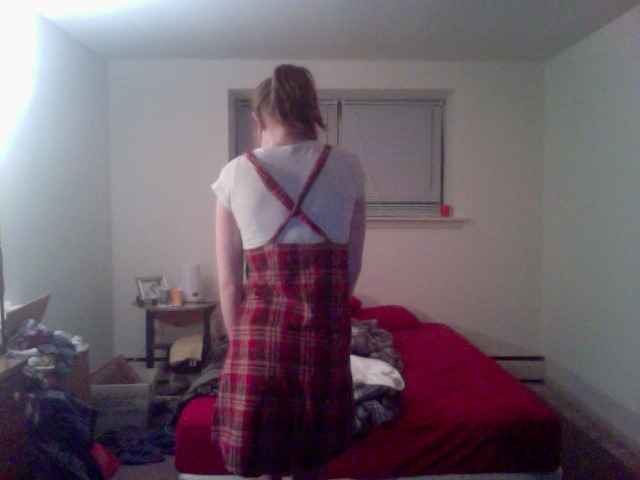 I tried it on and pinned the sides to get it to fit properly. 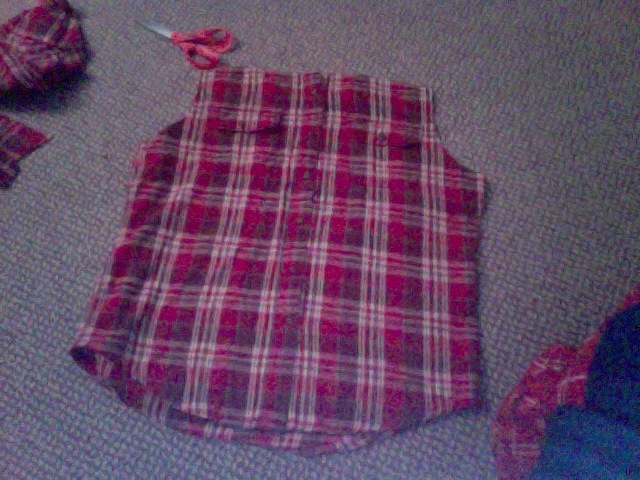 Then, I sewed the pin marks and hemmed the top. 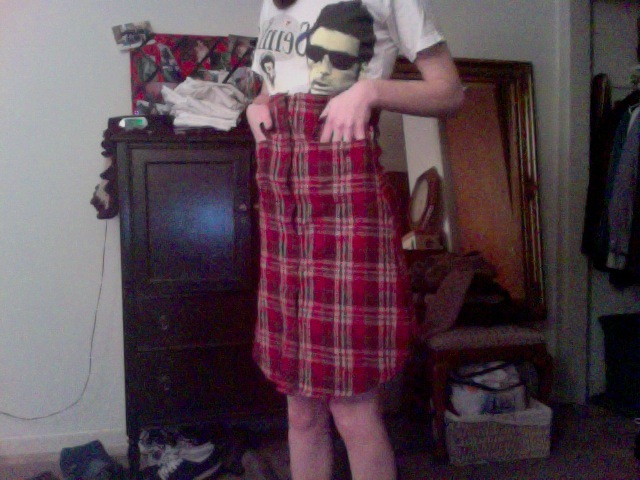 At this point, I realized a flannel pencil skirt was a bit weird looking. If it had more swoosh to it, it would have been a little better, I think. “No fear!” said I, “I shall make a jumper!” (I speak to myself very formally.) To make the straps for the jumper, I measured from the top of the skirt, over my shoulder, to the top of the skirt in the back. (Actually, Jordan measured it.) 27.5 inches. 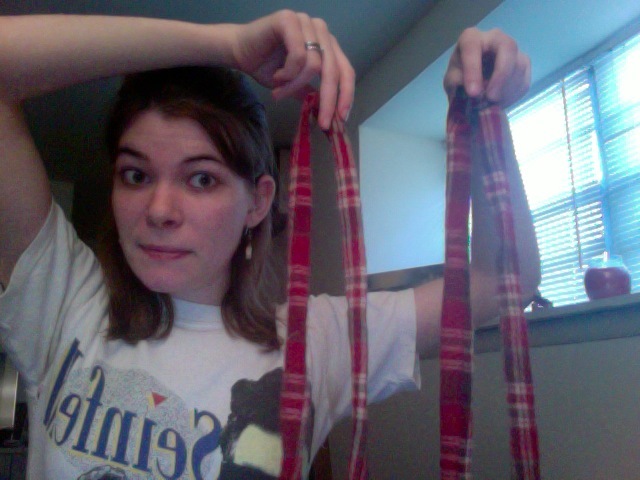 I cut four fifteen inch strips, then sewed them so I had two thirty inch strips. I took one of the thirty inch strips and sewed it to make a tube, with the wrong side of the fabric on the outside, then turned it right-side out to hide the seams. Then I did the same thing to the other strip. Turning them right side out took about half an hour. Ugh. Finally, I pinned the straps to the front of the skirt and then had Jordan criss cross them and mark where they should go on the back with tailor’s chalk. 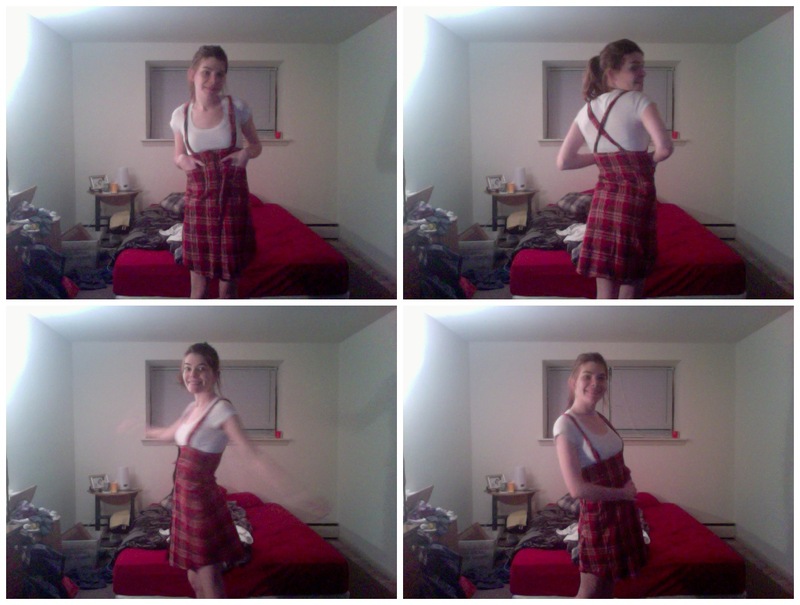 I sewed them down, trimmed the excess, hemmed them, and tried it on one final time! 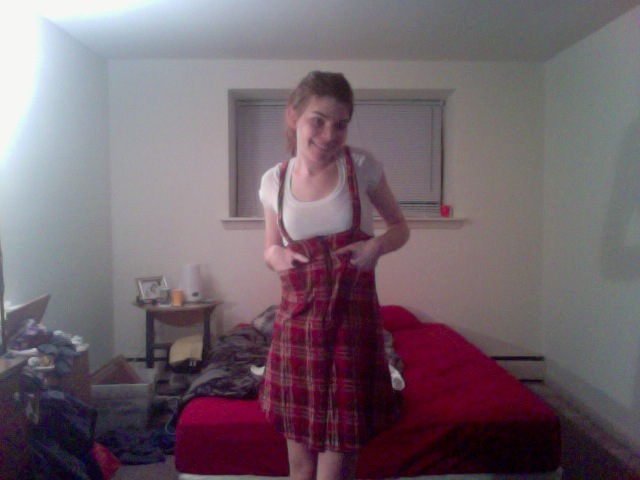 I’m going to wear this to work tomorrow, I think! It will dress up nicely with leggings and a long sleeved shirt! What do you think, was this a good start to the New Year? You look so cute in the jumper! Such talent! I liked the video, too. It was the perfect antidote to my end of holiday doldrums!